We are to leave the Morrow home shortly for the airport for the flight home. This has been a great trip and I trust that only good has been accomplished. I am grateful for every opportunity to teach God’s word. 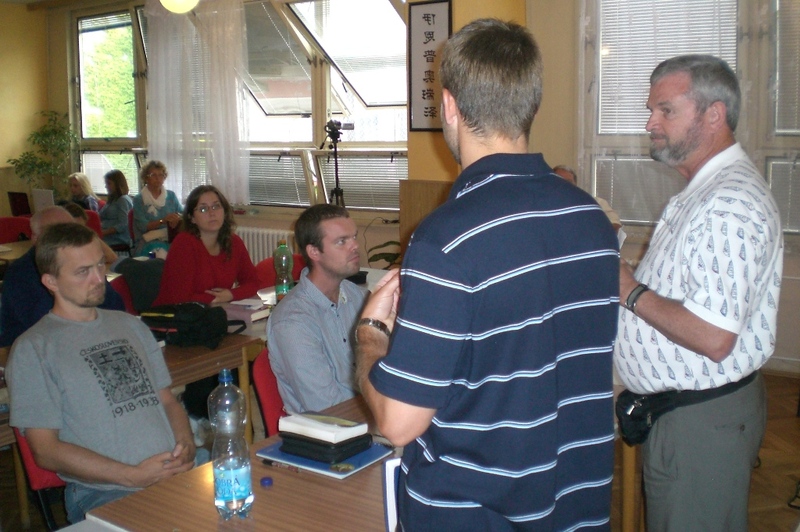 The photo below is from one of the sessions in Kamenice. Mike does a great job of planning these annual lectures. Session at Kamenice. Mike Morrow on far right. Photo by Leon Mauldin. Mike’s lovely wife Tatiana helped me by inserting Czech translation for English text in my PowerPoint slides. I’m glad my wife Linda could be with her as well as the other ladies here. 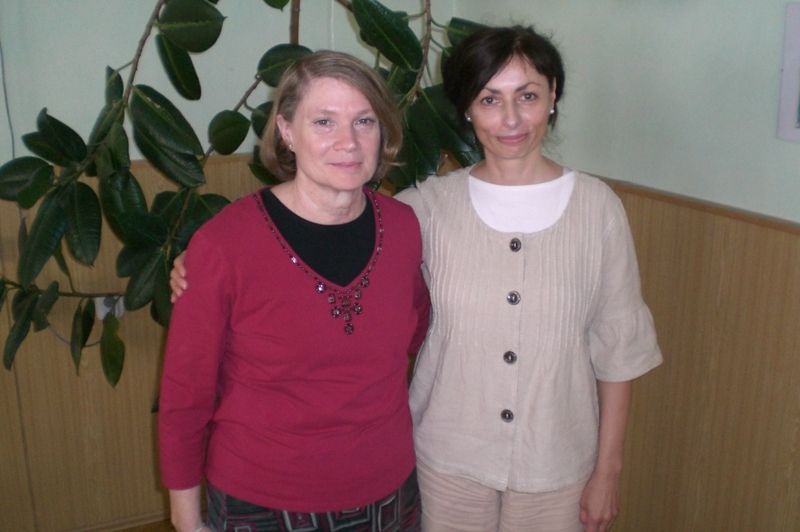 Tatiana Morrow (right) and Linda Mauldin. Photo by Leon Mauldin. This annual lectureship furnishes a wonderful opportunity for European Christians from a widespread area to give and receive encouragement to/from one another. One of the questions that was asked during a Q&A was on the subject of cremation; what does the Bible say? Here is an answer I posted some years ago on www.goodfight.com (click on “Short Answers to Tough Questions”). Question: What does the Bible say about cremation? 1. Passages–What few Biblical references are made to cremation are in the Old Testament. 1 Sam. 31:11-13: Burning of bodies of Saul & his sons; this probably was an emergency measure lest the Philistines further molest the bodies. Lev.20:14; 21:9: Those guilty of sexual immorality. Josh. 7:15,25: Those under a curse such as Achan and his family were to be burned. Occurrence of cremation is rare and exceptional. 2. Lack of proper burial was a great misfortune 1 Kgs.13:22; Jer. 16:6. 3. Related passages: Amos 2:1: He (Moab) burned the bones of the king of Edom into lime. cf. Amos 6:10. 4. Quotation from Edersheim: “Cremation was denounced as a purely heathen practice, contrary to the whole spirit of Old Testament teaching.” (Sketches of Jewish Life, p. 16). Ghassul flourished during the latter half of the [?] fourth millennium. Archaeologists have documented the Ghassulian custom of burying the dead in ossuaries (ceramic receptacles for bones) in many other areas, particularly the coastal cities near modern Tel Aviv. These ossuaries were usually shaped like animals or houses, in imitation of those used in daily life. After the body was cremated mourners buried the ossuary in a stone cistern together with provisions for the afterlife. 7. N.T. Emphasis. As I reflect upon the question, emphasis is placed on using one’s body in life to glorify the Lord (Rom. 12:1,2; 1 Cor. 6:18- 20); and upon the entrance of the soul into the hadean world at the point of death. Emphasis is not given to the disposal of the body. Stress is not placed on the funeral, but upon the life one lives prior to the funeral. cf. Lk.12:4; Matt. 10:28. Our hope is the resurrection with the new, spiritual, immortal body (see 1 Cor. 15; Rom. 8:18ff. ; Phil. 3:20-21; 1 John 3:1-4). 8. Personal Preference. The question does not ask for my personal preference… but I do not want cremation for myself, or for any member of my family. But I know of no New Testament principle that is violated by cremation, if one does make that choice. This entry was posted on Monday, August 9th, 2010 at 11:57 PM and is filed under Bible History and Geography, Bible Study, Friendship, Funeral. You can follow any responses to this entry through the RSS 2.0 feed. You can leave a response, or trackback from your own site. Appreciate so much your pictures and comments. Hope you flight home is safe and you get to see those grand-babies real soon. Thanks Beulah & Keith, for following our posts, and for your prayers. We made it safely hope about 8PM last evening.